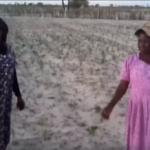 Video: Mahangu farmers, Ndapandula Amwaama and Loide Wilbard showing their dead and dying mahangu plants as the drought continues to devastate the northern regions. THE Northern regions of Namibia are facing a drought situation of a magnitude that goes beyond anything seen in recent years. Octogenarian Hertha Nelenge of Okahao constituency in the Omusati region says she cannot remember ever seeing a drought of such proportions. Unlike many others, 79-year-old Saki Lungameni of Ondobe constituency in the Ohangwena region has not given up hope. “God has not forgotten us. The rain will still come to at least provide water and grazing for the animals. We humans can find alternative ways of survival,” he said. Ndapandula Amwaama and Loide Wilbard of Uukwandongo village, Omusati region, say they have given up any hope of a harvest this year. Petrus Kambala, the councillor of the Onyaanya constituency, Oshikoto region, says the situation in his area is “very bad”. Oshakati resident Paulus Mambo who is also a cattle farmer, said that he has visited his cattle post in the grazing areas south-west of Oshakati what he saw there has shocked him. “A disaster is looming. There is no grazing and no water for our animals. Our livestock will be wiped out should the rain stay away for one more week,” he said. The rainy season started late this year and only sporadic rainfall was registered in some areas, mostly east of Oshikoto, east of Ohangwena and parts of Oshana and Omusati, while vast areas have yet to receive a single drop of rain. “In a normal year I plough my mahangu field in December. We are now in March but I have not yet ploughed my field because there is no rain. However, if it starts raining today I will still plough my field because harvesting 30kg is better than nothing,” said Pastor Paulus Christian of the Full Gospel Church of God. Those farmers who have received some rain and have ploughed their fields are now devastated in watching their young mahangu drying up. Meanwhile, the effects of the drought are felt across the board. Private tractor owners could not be contracted to plough the fields; seed vendors could not sell their products, and the unemployed women and youths who formed income generation groups, contracted to help farmers weed and harvest, are inactive. Angolan nationals who visit Namibia to do shopping or visit relatives, say the dramatic drought situation is equally affecting the southern parts of Angola. The three main churches in the North – Lutheran, Anglican and Catholic – recently launched a prayer campaign to entreat God for his Divine intervention to end the prolonged dry spell.